Jay: Welcome everybody to Convince & Convert. It is Jay Baer joined today by a very special guest, my friend who is the Director of Community and all things fabulous at BlogWorld and also the author of Online Community Management For Dummies , Ms. Deb Ng. Deb, how are you? Deb: I am terrific, Jay. How are you? Jay: I am marvelous. I love your festive red background for videos. Deb: Thank you. This is my dining room. We’re renovating. So everywhere I was sitting today, I’m like, “Oh, I don’t want people to see that. Oh, I don’t want people to see that.” So I came in my dining room where it was just a red backdrop. Jay: It looks great. You should use it. I really like it. It pops as they say. Deb: Well, my husband is Chinese, and red is a very lucky color. Jay: Well, I loved the book. I thought it was really, really fantastic. I recommended it to several clients already. It really is a treasure trove of advice and best practices around community management. How was it writing it? Deb: It was fun writing it. It’s the stuff I’ve always wanted to write, and it’s the stuff I talk about when I speak at conferences and I blog about. And it was actually a hard sell for Wiley. They weren’t sure people would want to buy a book about community management. But it sort of wrote itself. It was the easiest thing I ever wrote, I have to say. It was so simple to write. Jay: Wow. That’s a ringing endorsement. Easiest thing you ever wrote. That’ll work. Deb: Well, it’s second nature I think, to me. I don’t know if that sounds kind of silly, but it just all came so quickly. Jay: One of the things that I see all the time, and you do as well I’m sure, now that many companies have come around to the belief that they should have a community, there isn’t a lot of community activation, or perhaps not as much as there should be. You talked about that a little bit in the book. How can we get people to do stuff as opposed to just click one button and join? Deb: It’s hard, because we don’t want to spam people, and we don’t want to say, “Will you please comment on my blog, dammit?” I think we’ve all had those frustrating moments where nobody answers our calls to action. So I think we have to make it entertaining. We have to make it enjoyable. We can’t always be a commercial for our product. You have to make life a conversation and draw the community in. If they feel as if they have a say in the brands and that they’re a living, breathing part of the community, they’ll participate more, and they’ll advocate for you. Jay: What we see now is, as companies get more serious about this kind of work, an increasing usage of content calendars and community calendars and things that have more of a plan around how to do this. Do you think that kind of work is the enemy of true community, or can they coexist? Deb: Yes and no. I do have some things that I do on a regular basis. For example, the first Monday of every month is brag your blog day on the BlogWorld Facebook page, because I don’t want to forget. If I don’t schedule a certain day for things, I forget. I will say I’ve never scheduled a tweet in my life. I don’t believe they’re engaging. I have scheduled blog feeds on Twitter, but I don’t schedule tweets, because you can’t have a conversation. You can’t schedule community. So, I think there are times when you can create an editorial calendar and plan out a course of action. But as far as scheduling engagement, I just don’t see it happening. Jay: I like that quote, “You can’t schedule community.” That’s good. Consider that stolen. So many times now, it seems that Facebook in particular has become the de facto community platform. How do you feel about that? Deb: I have mixed feelings. First of all, Facebook is where the people are. The majority of Americans or even globally, the people who we want to reach are on Facebook. So it makes sense that we put a lot of our effort into Facebook. Most of my friends and neighbors don’t want anything to do with Twitter or Google+ or Pinterest or any of the other social networks, so it makes sense that we’re on Facebook. But I really do wish that I had the same engagement levels on the other social networks. Twitter has turned into such a disappointment for me, because it used to be the best place to go for conversation. Now, it’s sporadic unless we have our weekly Twitter chats, and it’s sort of like a link farm. So, I will put half my efforts, I would say, for the day into Facebook to grow that community, because that’s where we have to be, and that’s where most of our community are, but I won’t give up on the others as well. Jay: One of the things that you said in the book was trying to steer your community away from negativity, which I thought was a really commendable point to make, because we see, certainly in the social media space, there are blogs out there that seem to use negativity as their oxygen. I try not to fall into that trap myself, but they’re out there. What’s your take on it? Deb: I think that negativity begets negativity. So, if you have a space that makes people feel uncomfortable, it’s going to be like the earth after the apocalypse. Only the cockroaches are going to be there. People who thrive on negativity are going to stick around, but the people who want an intelligent conversation where they’re not always being accused of something or being called a loser, they’re going to move on. So I have no problem with disagreement as long as it’s respectful disagreement. I know that I’m not right all the time, most of the time. But you can tell me why without telling me to go make a sandwich. Jay: So, can we disagree without being disagreeable? Jay: One of the things that I loved about the book was your section on the welcome plan, which I think gets overlooked so often in communities. It doesn’t matter whether it’s a blog or Facebook. That first time that person peeks their head out is when you really have to give them succor and comfort and make sure that they stick around. Can you talk a little a bit about that welcome plan and how you think it should be done? Deb: Sure. I compare it on my community to the high school dance. So nobody ever wants to be the first one up to dance. So maybe the chaperone will sort of start encouraging people to get up and dance. They might introduce a couple or get up to dance herself, although we would laugh at any chaperone who did that. Jay: I was just thinking about that. I’m like, yeah, that would really get the party started, when the chaperones are dancing. Deb: But somebody has to get the party started, and that’s where the community manager or moderator comes in. This probably works mostly for forums or blogs, because they have an area for this, but a welcome folder with frequently asked questions, a place to introduce yourself, and just a place to ask questions make people feel at ease. Then maybe the community manager can help to get that person, make them feel comfortable around the community, introduce them to people, and just bring them into the conversation. I honestly believe that it’s in a community manager’s best interest to know as much about her members or his members as possible, because then they can draw them into the conversation and know their areas of interest. Jay: One of the things that you’ve always done really well is the combination online/offline community. Your community doesn’t really exist unless it exists at some point in three dimensions. Can you elaborate on that a little bit and how you can make your community work in the real world? Deb: I think that it’s fine and dandy for you and I to tweet a lot and talk on Facebook now and then. But what do we really know about each other besides what we share? You don’t really know a person, I think, until you meet them online. When you know people, you trust them. Jay: And that’s one of the great things about BlogWorld. It allows those kinds of interactions and conversations to take place and why it’s an event that most of the people in the social media and blogging industry would never dream of missing. Deb: It’s the first conference I ever attended actually. Jay: Wow. I want to see if anybody else who is watching this video, the first time they ever went to a conference ended up being the community manager for that conference. That would be some sort of a crazy . . .
Deb: Years later, too. That was in 2007. I was hired in 2010. Jay: Wow. I didn’t know. That is a crazy tale. How about that? Good for you. 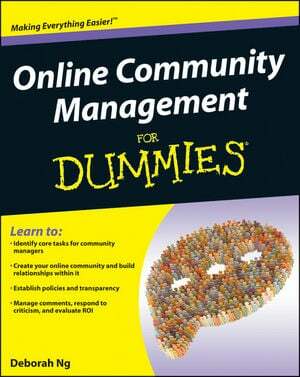 I am a big fan of this book, Online Community Management For Dummies . Do not let the fact that it is a Dummies book scare you, or do not look down your nose at it, because I feel like I know a fair amount about this kind of stuff, and I learned a lot from this book. It’s like a fire extinguisher of knowledge, and I’m really, really glad that you wrote it. Jay: Deb, thank you as always for all that you do and for writing the book and for spending a little time here at Convince & Convert. Deb: Thank you so much for having me, Jay.